Cahyo is a seasoned qualitative research consultant with 15+ years experience. 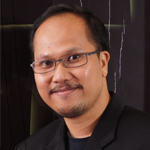 Started his career in Nielsen Indonesia, he then joined Millward Brown to setup its Indonesian qualitative business and head it up for 5 years – before trusted as APAC Regional Director for Learning & Talent Development for 2 years within the same company. Afterward, since 2013 Cahyo started his own consulting boutique spanning his 3 spurs of passion in marketing — research, knowledge, and strategy. Considered as one of the most sought-after research consultant in Indonesia and the region, he and his small team has partnered up with various blue-chip clients at local, regional, and global level – ranging from FMCG, banking, tourism, tobacco, electronics, pharmaceutical, up to leisure and entertainment industries.